First and foremost our main attraction is one of the most lovely beaches in the Northeast! A half a mile of wide pristine “sugar-sand” beach gives you and the family plenty of room to spread out and enjoy your day in the sun. C’mon in… the water’s fine… and so is that sand. Build a castle… sculpt to your heart’s content… OR… just lay your towel out and bask on its meticulously-groomed comfort! Along the side of the boardwalk opposite the beach, you’ll find all the rest Ocean Beach Park has to offer including a nature trail, picnic area, playground, free kiddie sprayground, Olympic size pool, triple waterslide, mini golf course, kiddie rides, gift shop, Boardwalk Creamery, Sandbar Café, and Boardwalk Galley. Check out our entertainment schedule for nightly events! 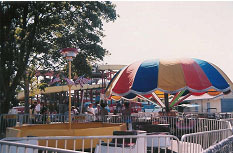 Relive your own childhood as you watch your kids enjoy all the lovingly restored, old-time, kiddy rides. From the classic and graceful carousel, a little train ride, to the rest of the rides, which consist of all those you most fondly remember…the little bumble-bee-painted flyers…the kid-sized spinners…the tiny cars for their first “driving experience”. We’ve expanded to include some grown- up rides as well, including those old favorites, The Scrambler and The Octopus! AND…on Monday nights, there is still a special price for kiddy rides. For the kids of all ages, Ocean Beach boasts a wonderful arcade, where, again, you can relive a little nostalgia, with Skee-Ball…winning tickets you collect against a wide variety of prizes for which they can be redeemed. 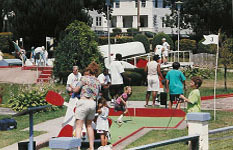 We have a fine 18-hole miniature golf course that’s sure to be fun for the entire family. The area where it is located is wonderfully landscaped and the views are as good as from anywhere else in the park. This is another Monday night deal, as well, at $2.00 per person per round. So c’mon out and try your hand at putting’ through the windmill…or test your skill against the whale…Ocean Beach’s stalwart mascot. The entire course is great! 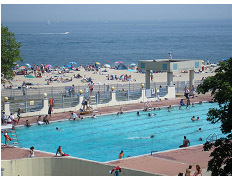 Ocean Beach Park also boasts a 50-meter Olympic-sized pool. We have changing rooms and token-operated lockers for your convenience. For the more daring, check out our Triple Waterslides which offer a tremendous thrill as well as a spectacular view of the park and surrounding ocean views. 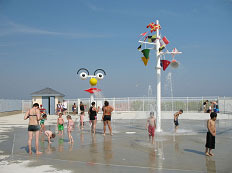 For our younger guests under 8 years of age only, we offer our free spray park. We ask that adults observe from the perimeter so all kids have a chance. For those who want to get in their daily workout, Renegade Health Clubs has a spectacular ocean view facility right on the boardwalk. Daily rates are available. In addition to the spectacular ocean views of the boardwalk, we have a nature walk that overlooks the back side of the park, a beautiful estuary called Alewife Cove. We’ve got all the options covered for beach dining. Our Sandbar Café is located on the upper deck overlooking the beach and boardwalk and offers full service meals and adult beverages daily. For a quicker less formal approach, check out the Boardwalk Galley on the lower level, also overlooking the ocean with faster foods including our famous clam fritters, great burgers, salads, wraps, fried foods and more. Denny’s on the beach offers char broiled burgers and dogs, beverages and fried foods without ever leaving the sand! For an afternoon treat, don’t miss the Boardwalk Creamery. Many guests tell us its the best soft serve anywhere! We hope you will agree.